3. Although we have been unable to locate few living authors of the Yizkor book, we have been in contact with their descendants and all whom we have spoken to have generously agreed to allow us to use the material from the book for this web site. All hope that this will lead to renewed contact and more information about life in Rokiskis and of its many descendants. 4. SIG member Jules Feldman has shared a biography of his family member Rachmiel (Richard) Feldman with us. Rachmiel is the author of the Yiskor Book chapter entitled Childhood Joys. 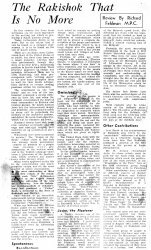 When the Rakishker Society in Johannesburg published Yisker-bukh fun Rakishok un Umgegnt , the Rokiskis Yiskor or Memorial book, in 1953, the following articles appeared in the South African Jewish newspapers. 3. To see the Rokiskis Yizkor List, taken from Yizkor book of Rakishok and Environs, pp. 540-620, and translated by Steven Weiss, go to the Yizkor Book Project. 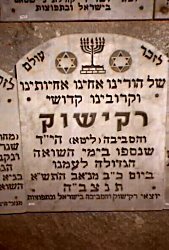 This list includes those killed in the holocaust in Rakishok and surrounding towns, as remembered by their families (although, it is not a complete list of those killed in Rakishok). 4. Click on the appropriate page below to see a partial index of the names mentioned in the Rokiskis Yiskor book. This index was prepared for us by SIG member Rosalind Abrahams Romem. Please let us know if you have any corrections or additions or can finish the index. David Sandler, working with Bella Golubchik, the daughter of the original publishers, Ethel and Ralph Aarons, decided to translate the original 1952 Yizkor Book, which was written in Yiddish. 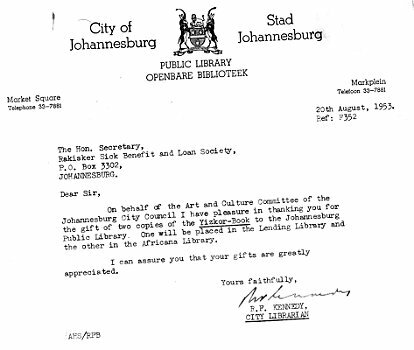 However 80% of the book had already been translated and put on-line under the aegis of JewishGen and its Yizkor Book project, under the leadership of volunteer Tim Baker. Sandler, working with the JewishGen project, assisted with the remaining work on the book and is publishing the Memorial section of the book in a separate volume. 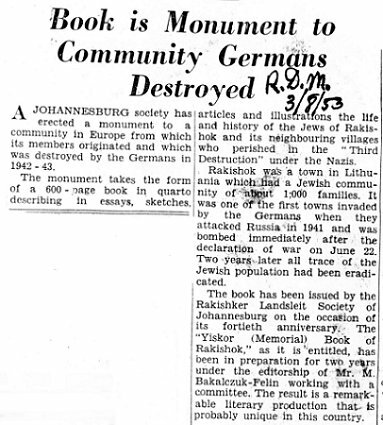 Naomi Musiker, archivist at the South African Jewish Board of Deputies, wrote a very interesting and informative article about the Yizkor Book and its translation. Thanks to both Naomi and Jewish Affairs publisher David Saks for permission to include the article here. And thanks to Rokiskis SIG member Ada Gamsu for bringing these to our attention and getting permission for us to include these. Click on each of the thumbnails to see a full-sized copy.